Weekends in February are Winter Carnival Time! Lake George Village offers a month-long celebration of winter during this annual family-friendly festival. 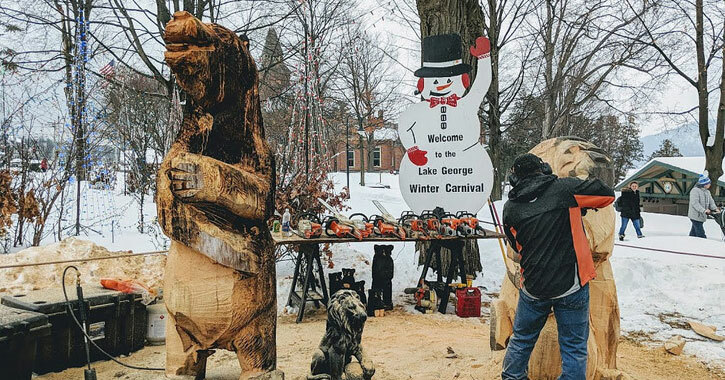 The Lake George Winter Carnival takes place each weekend throughout February (Saturdays and Sundays from 2/2/2019-2/24/2019), so mark your calendar now and get ready to take part in the fun. Relish the warmth of tasty samples during the chowder, chili, BBQ, and chicken wing cook-offs. Witness the always hilarious and fun outhouse races - a crowd pleasing favorite - as well as ATV races, polar plunges, fireworks, and more! Kids can participate in children's activities, go for a pony ride, and toast marshmallows on the beach. And that's just a sample; there's so much fun for everyone. View the complete list of events and activities below. What Happens If There's No Ice? Although Lake George is usually frozen solid by February, there are some years when mild temperatures cause the ice to be unsafe for the Winter Carnival's normal activities. If ice-dependent events need to be canceled or relocated, that information will be announced on the Winter Carnival's Facebook page or website. We will also update our schedule with the latest information as it comes in. Planning a trip to Lake George during one of the four Winter Carnival weekends? There are plenty of places where you can stay overnight this time of year. From family-friendly hotels to cozy cabins, book your room and prepare for carnival fun! Watch our Winter Carnival video below! The village of Lake George offers a month long celebration of winter during the Lake George Winter Carnival, an annual family friendly event. The Winter Carnival is held each weekend throughout February. The same lake enjoyed for its many summer activities and views becomes the playground for a whole new season. With the lake safely frozen over, people flock to the Winter Carnival to participate and watch a number of activities held on the ice and around the lake. The crisp winter air provides a lively sensation adding to the excitement. Snowmobiles and ATVs become the norm for traversing the lake. Many traditional activities are held both days every weekend, but each weekend includes new events and thrills. Many of the village restaurants and pubs are open providing a great view as well as a place to warm up. The Lake George Winter Carnival, another part of your lakegeorge.com experience.